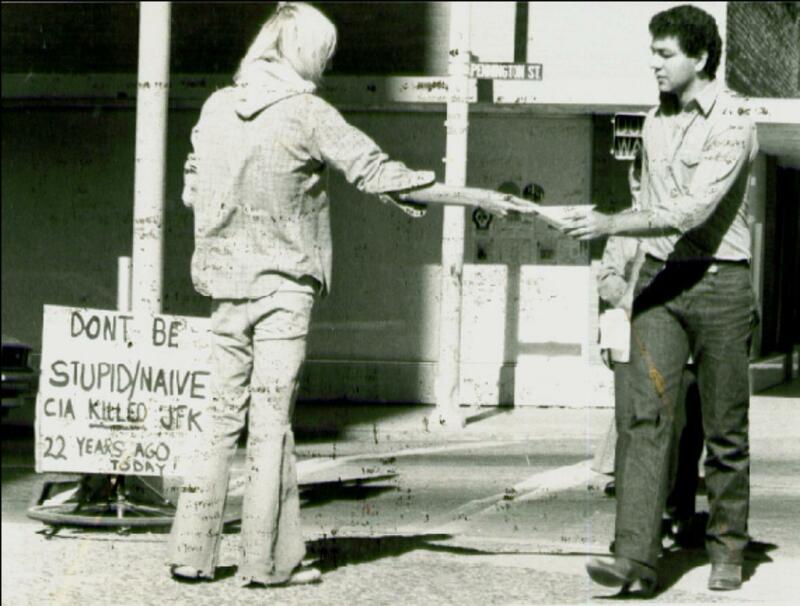 January 1, 1980 is the day I arrived in Tucson. Spent the summer in Fort Collins, Colorado working on my Samizdat — famous people who believed in abolishing money. I camped out near the University. In the summer a few years earlier I saved up a lot of money setting ribbon rail in the Sandhills of Nebraska for Burlington Northern — I set spikes with a 5-pound hammer and later operated a bolt machine. Spent weeks camping out in the National Forest. Winter drove me to warmer climates. Previously I wintered in the National Forest east of Huntsville, Texas but was told by a judge to get out of town. If it wasn’t for the judge’s wife who operated the dog pound and hated to hear my dog cry, the judge told me, I’d spend some time in jail for trespassing, swimming in a rancher’s pond. The second or third time my dog saved my life. I studied at the University of Arizona and lived under an Aleppo Pine in a 1970 VW bus on a vacant lot adjacent to the Rillito River at 3812 N. Country Club Road (now it’s Racket Club Condos) — even had a mailbox. Several neighbors liked me there because I kept people from partying. The University library had all the Warren Report volumes as well as the House Select Committee on Assassination volumes and the Rockefeller Commission Report on CIA Activities in the United States of America, which Ronald Reagan before he became President served on. All the facts in Coup d’Etat checked out. My heart sank. We no longer have a democracy. I sewed (by hand) the dress and backpack, I was homeless by choice. Every weekday I made a new sign and demonstrated downtown. (The twin Superior Court Judges Roylston liked me and I made many friends downtown.) One day I collected all my signs and went to the university. My pic was on the front-page of the Daily Wildcat. 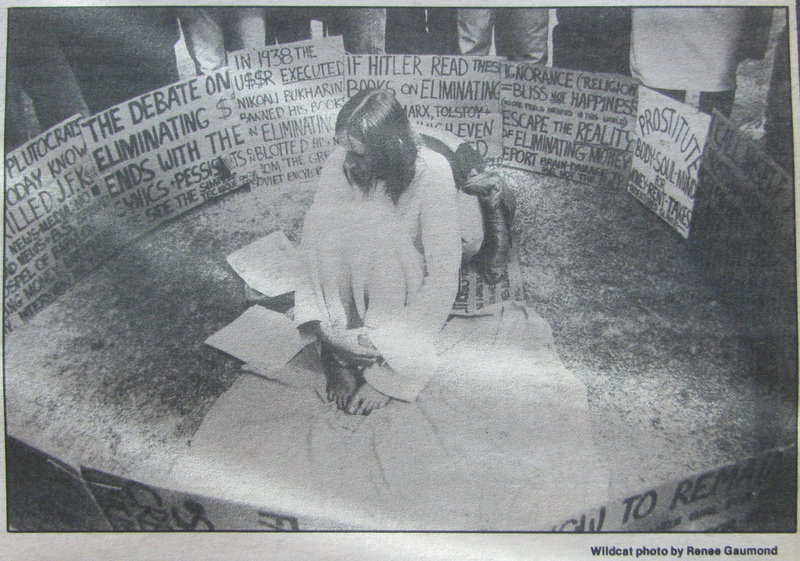 I began demonstrating at the University. Got falsely arrested several times, spent time in jail. A judge (Robert B Donfeld) told me to get on SSI (government disability). He also told me to get a lawyer and sue the University. I did. I don’t think the psychiatrists thought I was crazy. I felt like I was on sabbatical. At the time I didn’t smoke or drink, all my expenses were documented in a notebook. I showed them to the psychiatrist. My Lawyer, Jeffery J Buchella sued the University and won. I got about $2000, he got much more. Rented a duplex apartment from Don Rollings at 908 E 10th Street. There I was able to make better samizdats. Rollings kicked us all out of his apartments and bulldozed the homes. He owned almost the whole block, including his car dealership, bulldozed. I moved to another place and have lived there ever since. If it wasn’t for Carmine Cardamone and County Supervisor Ed Moore, I never would have been able to pay the liens off on the house and own it. My landlord abandoned the property due to healthcare liens from the former owner, Alice Frantz who built the house in 1924 and was put in a County nursing home. Me passing out Samizdats downtown at Stone & Pennington. Note my Samizdats pasted to the window of the building. I dyed my hair platinum blonde. One day while passing out samizdats downtown I met Larry Cardamone, twin brother of Carmine Cardamone, who later became a State Representative. We were very good friends. Carmine told me about property tax liens. I invested and eventually was able to make a good living, getting properties and selling them. While downtown passing out samizdats, the twin judges Robert O. Roylston and Richard B. Roylston took a liking to me. Carmine introduced me to John Kromko, who was a former State Representative. I did a lot of work for the Democratic Party. I learned how to make silkscreen signs. Didn’t make much money but it was fun meeting people. One of Kromko’s girlfriends was Alison Hughes, she let Carmine, Larry and I house-sit. I started getting a lot of vacant lots and eventually fell out with Carmine and Larry over an argument with Larry about religion (I think all religions are irrational but love Jesus, the radical, who told his disciples to go forth without money). I remember him telling me, “You think you know everything”! I agreed. One place I really liked was a bankrupt subdivision on the far SE side of Pima County called New Tucson (renamed “Sycamore Vista”). People in the 1970s from the rust belt bought vacant lots there thinking the lots would be developed and they would make a lot of money. Nothing happened and they let their properties go by not paying the taxes. I had 50 lots there. I knew, eventually someone would buy up the other 1000 lots and develop them. Eventually someone did. I thought I was going to be a millionaire. The people who bought the majority lots convinced us to join an HOA. I resisted at first. What they did would be against the law now. I saw no way out, it was kind of like Stockholm syndrome or being raped, you go along to avoid worse things. Amelia Craig Cramer, a deputy County Attorney sued the HOA on our behalf to require unanimous consent to join the HOA but at the time development was booming, I wanted to be fair so I went along with the developers. That was the biggest mistake of my life. The judge sided with the developers. Normally, when you own a vacant lot, you don’t pay to help your neighbor develop their lots. I thought when I bought the lots a developer would do all the work and we’d get a free ride. I sold three lots and made a $60k profit. The majority lot owners helped us sell our lots to builders with only a 2% commission. After the economy collapsed they defaulted on the loan causing National Bank of Arizona to lose $35-million – the biggest loss in the bank’s history. Our lots were encumbered with development liens. I never expected these liens to stick. Figured I could swing them when we sold them. The liens never expired. It was a stipulation I insisted on: the liens could not be collected until the lots were finished and we could sell them to pay off the liens. At one of the HOA meetings Bob Bambauer told us we were being overcharged for the work. Bambauer was the local head of K.B. Homes. He said KB sued the majority owners because they reneged on an agreement to sell lots and lost. We later found out that some of the work was not adequate either. A new majority lot owner, Steve Russo, a lawyer bought the lots from the bank. He appointed Ceci Cruz, Virginia Yrun and other community activists to the HOA board. Ceci was good friends with Alison Hughes. Together they formed the Tucson/Pima County Women’s Commission. Yrun eventually took the State Senate seat of Hugh’s boss, the late Dr. Andy Nichols. I made political signs for Nichols, met him several times. Met Yrun a few times too at Kromko’s house. Kromko was the guy to know to get elected. He had a skill with mailing labels/lists targeted to people who voted. I stuffed, stamped, labeled, sorted and bundled for mass-mailings thousands of envelopes for Democratic candidates for little or no money and took them to the Cherrybell post office. Also helped gather signatures to get democrats on the ballot. Russo, realizing his mistake quickly took them off the HOA board because he knew the none of the lot-owners liked the HOA because we were taxed (made to pay dues) by them for nothing and several thousand dollar development liens on our lots even no dirt was turned on those lots and Russo even admitted the development plans were “garbage” and sued them for it. We never got any of the money ad Russo now owns many (if not all) of the assessment liens. Russo has the activist Democrats on the Board his Industrial Development Authority of the County of Pima. Anything they want, they’re likely to get from the Pima County Board of Supervisors, who must approve the bonds they negotiate with Charter Schools. The Pima County IDA is supposed to support low income families get housing. If Cici and Yrun knew what Russo is doing to us lot owners, I doubt they would associate with him. Russo started selling his lots in Unit 2. I owned two lots in Unit 2, which I paid $26,000 per lot to develop. I was excited. I expected Russo to help us to sell our lots. I waited until most of his lots were sold in the west half of Unit 2. I asked him at one of the HOA meetings if he would help us sell our lots. He said he would. I’m very good at selling lots but quickly learned that major builders like KB Homes would not buy from individual lot owners. Before the Great Recession, which Bill Clinton caused, small builders wanted us to subordinate the value of the lots to them so they could get a loan. I realized this was a stupid idea. They would just squander the money and leave us with no equity. That’s why I asked the former majority lot owners to help us sell our lots. They agreed and gave us very good terms — only a 2% commission! That’s how I made the $60k profit, selling three developed lots in Unit 8. As almost all the Unit 2 lots were sold, Russo sued me — because of the development liens on my lots in Unit 5 — and refused to help us sell in Unit 2. I spent almost $100,000 in legal fees and lost! I lost about 45 lots, my retirement plan! Russo still refuses to help us sell even though it’s against the HOA CC&Rs, Article 10, which say the purpose of the HOA is to develop the lots and help us sell. This entry was posted in Uncategorized and tagged Abolish Money, Alice Frantz, Alison Hughes, Amelia Craig Cramer, Andy Nichols, Bob Bambauer, Carmine Cardamone, Cecilia Cruz, CIA killed JFK, Coup d'Etat in America, Don Rollings, DR Horton, Ed Moore, Industrial Development Authority of the County of Pima, Jeffrey G Buchella, John Kromko, Kennedy assassination, Noam Chomsky, Pol Pot, Richard B. Roylston, Robert Donfeld, Robert O. Roylston, Rockefeller Commission, Ronald Reagan, Steve Russo, Tucson/Pima County Women's Commission, Virginia Yrun. Bookmark the permalink.